The United States National Institutes of Health (NIH) has issued a draft report that highlights the dire need for scientific research that will help find a cure for the millions of people suffering from myalgic encephalomyelitis/chronic fatigue syndrome (ME/CFS) worldwide. The report also highlights the fact that the decades-old UK Royal Society of Medicine’s Oxford criteria for ME/CFS are severely “flawed,” and that continuing to use these criteria may “cause harm.” Further, the NIH report says that the Royal Society definition should “be retired” and replaced with a single case definition agreed to by the ME/CFS community. 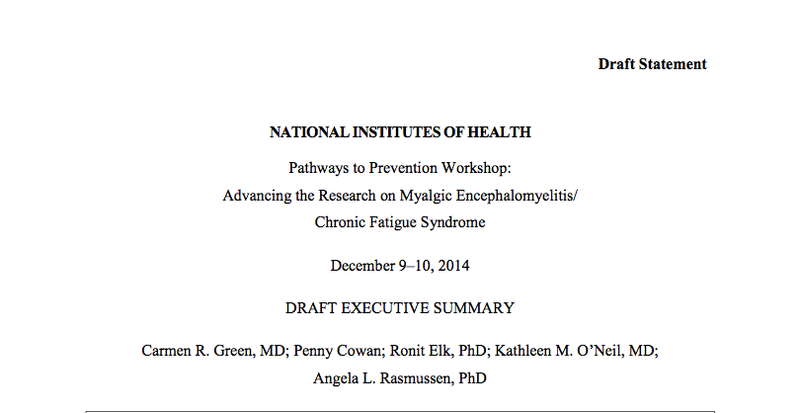 These statements were made in a draft summary of a short multidisciplinary Pathways to Prevention Workshop co-sponsored by the NIH and Trans-NIH Myalgic Encephalomyelitis/Chronic Fatigue Syndrome (ME/CFS) Research Working Group mid December, and attended by experts and interested persons. It was posted on the NIH Office of Disease Prevention (ODP) website for public comment; and a final report is expected in a few weeks time. While the draft report does not mention the hugely controversial UK Medical Research Council (MRC) PACE (adaptive Pacing, graded Activity and Cognitive behaviour therapy; a randomized Evaluation) study trials, it effectively discredits the trials because they were based on these Oxford Criteria. There is absolutely no doubt that medical research has failed the ME/CFS community. Above all else, the workshop confirmed, yet again, that “ME/CFS exists.” In spite of the fact that there is still not a clear definition of the illness (or illnesses), there is acknowledgement that it overlaps other diseases, including fibromyalgia. But there is zero agreement in terms of research, prevention, treatment, or anything else. The draft report published by the NIH shows very clearly that people suffering from so-called ME/CFS come from all walks of life. There is absolutely no data available to indicate who – if anyone – is more (or less) at risk. Other revelations include the fact that over the past two decades, very little progress has been made to “improve the state of the science for patients with ME/CFS” (though these very patients know this to be true – they don’t need revelations). As it stands, treatments that are offered are completely “unproven,” and it is agreed (at very least by those attending the NIH workshop) that clinical studies have achieved virtually nothing. For instance, while depression (a psychological repercussion) often follows ME/CFS, this is not considered to be a psychological disease and the popular focus on fatigue alone probably doesn’t identify many cases of ME/CFS. As the draft report states, this is a very complex condition and research has a long way to go. The over-riding feeling in the workshop was, according to the draft report, that very little attention is given to self-management that can empower ME/CFS patients and help them improve their health. This appeared to be largely due to inadequate training of physicians. It was also found that focus on exercise programs further discouraged and stigmatized participation in research. According to the draft report, guidance and a lack of instructions for GET often caused more suffering and a fear that participants would harm themselves by participating in some type of physical activity even if it was only “mild stretching”. Sadly, it was reported that a lot of ME/CFS patients have been treated “erroneously” and misdiagnosed – and then given “potentially toxic therapies” that are often harmful and end up diminishing all hope. As the report states, there are a lot of questions that need to be answered. While those participating learned quite a lot about the mechanisms of the disease, because it is “a chronic, complex condition” that has no known cause and absolutely no cure, nothing that came out of the workshop can improve the lives of patients. The recommendations made in the draft report are far reaching and once the final report is released in a few weeks time, more might be known in terms of what may be ultimately be done to achieve its proposed strategies. Since the PACE Trial study results were first released four years ago, The Lancet Psychiatry has published no less than six reports each focusing on a different element of the results. The most recent was published online this week, stating that because ME/CFS patients have “fear avoidance beliefs,” exercise negatively impacts on their symptoms, severely reducing their chances of recovery. ME Research UK has slammed The Lancet Psychiatry report calling it complicated, misleading, inappropriate and ultimately absurd. “The data suggests that CFS patients without a comorbid psychiatric disorder do not have an exercise phobia. Prof. Peter White, a co-author of the PACE Trials report. Their conclusion quoted above indicates that only those CFS patients who did not have an additional psychiatric disorder, did not exhibit “exercise phobia.” Further, White maintains that both CBT and GET “can safely help a significant number of patients.” This in spite of the fact that the original data provided by the PACE trial showed that only 10 to 15 percent of ME/CFS patients were positively affected. If you talk to people suffering from CFS you’ll quickly discover that exercise frequently triggers intensified symptoms of this misunderstood disease. Furthermore, many of those suffering from CFS are unable to even conquer normal physical activity; for some even getting out of bed is an enormous effort. So for anyone to imply that their condition is in any way psychological is unspeakable. The US Centers for Disease Control and Prevention (CDC) puts it in a nutshell. The question on the lips of many people now is, Can we move forward? Will the NIH join forces with the people involved in its Pathways to Prevention Workshop. And together can they make a difference? In return, the US needs to scrap the merged term “ME/CFS” – source of so much confusion, incorrect diagnoses & incorrect treatment for patients who do NOT have a “fatigue syndrome” (chronic or otherwise), but DO have – let’s be quite clear about this – a neurological illness called MYALGIC ENCEPHALOMYELITIS. About time too, but the comments from the US NIH and CDC are pretty rich when you consider that for decades both organisations attempted to stifle research into this condition and promoted the “all in the mind” mantra so beloved by UK psychiatrists, along with so many medical professionals and government ministers. My only concern is that the draft report was compiled by “an unbiased, independent panel.” Cynically, I wonder what impact the final report will have and whether the NIH will act on its recommendations. In the meantime we live in hope that reason will eventually prevail. Not just pharmacological psychotherapies that are problematic and potentially unsafe if misused, but also equally non-pharmacological psychotherapies such as CBT. The fear of GET and exercise programs in general is well justified, and not just due to any inappropriate administration by clinicians, but also often due to the underlying ‘rationale’ and philosophy invoked to impose them. Psychosis is not a feature associated with ME/CFS, as far as I know. Did you mean the PACE study (unjustifiably) assumes or tries to imply that ME/CFS is primarily psychogenic? Because that is certainly true, despite the actual results failing to support that claim in any way. With serious methodological problems in how that barely measurable clinical ‘benefit’ was defined. Your comments in response to the NIH draft report are spot on. In terms of the PACE Trials, you are correct in assuming that what I mean is that the study unjustifiably implies psychosis. This in itself will be a topic we will be looking at more closely in future articles.